Guests coming to stay at a ryokan truly look forward to taking a bath as part of their travels. Lounging in a spacious bathtub soothes away daily fatigue and stress. Japan, which is a volcanic archipelago, is known worldwide for its many hot springs (onsen). 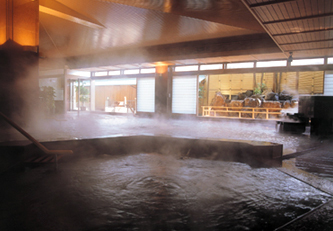 People often travel to hot springs hoping to be refreshed both mentally and physically, in other words, to benefit from the therapeutic effects of the hot spring (known as toji). Japanese ryokans attach great importance to bathroom facilities. The bathrooms are luxurious and spacious in order to fully satisfy their guests. At some ryokans, you can enjoy gazing at the beautiful garden just outside through the large, entirely glazed windows of the indoor bathroom. Another of the charms of hot springs is the magnificent landscape from the bathroom. The outdoor scenery comes in a rich variety of the sea, mountains and rivers, forests, bamboo groves, valleys, and so on. The Furoban (attendant in charge of the bathroom) regularly checks the quality and the quantity of the bath water and always keeps the bathroom and the dressing room clean so that the guests can enjoy bathing in a pleasant atmosphere. A morning bath is a luxury unique to a ryokan. Immersing yourself quietly in the open-air bath in the morning mist, your mind and body will gradually start to awaken.